...this has been published ages ago on 'another forum' but the content is all mine, and I hear the topic is still interesting, thus I've gladly 'recycled' it. 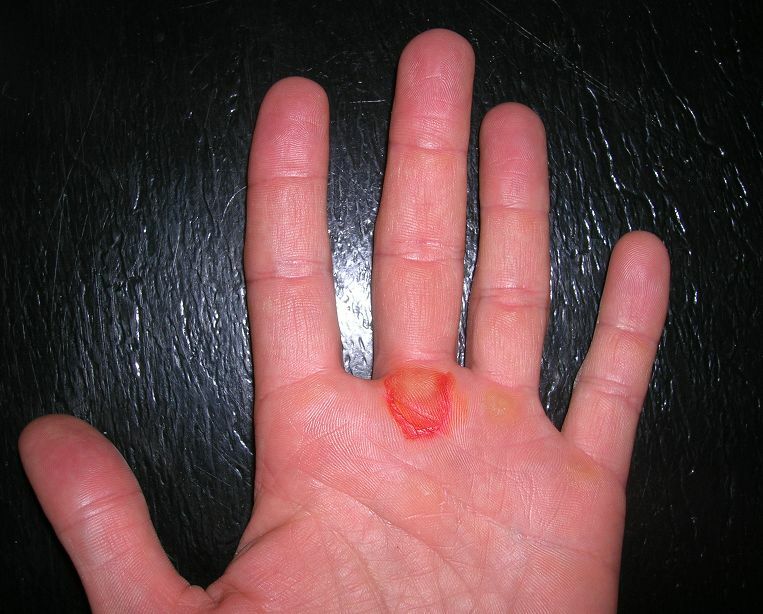 ...so: you finally had your first Parkour-related torn (hand-)callus yesterday? Hurts like hell, it's more or less bloody/messy as your average torn toe-blister from running, or hand-blister from tennis/golfing/you-name-it, and you feel like you're never going to be able to hold your weight onto anything anymore??? And well, welcome to the family! a torn callus can stop you from several days, to a couple of weeks (or more if you treat it wrong, developing an infection). Also, one has to make sure he knows what to do to prevent future "rips". So, after running a search on the forum for callus/rip (w/o much result), I thought I'd post the two best sources I found on the Net. Needless to say, I have my own way, which is a blending of what you can read here, ref. So what happens when you're growing a callus is, dead skin layering up on 'alive' skin. When you exercise pressure it hurts a bit, but the worst is when you add sudden friction, because the two skin areas have different flexibility and strength. If your lucky it just hurts more, and it's the sign you should do something about it (trim, scrape, moisturize them...). [advisory: the following link contains graphic content ] "ripped flap resting on torn callus"
But, bottom line: prevention is better than treatment! to #3.: pls. note that the source specifies: "please, use a non-perfumed hand lotion since the perfume is alcohol based and will STING." Also, alcohol dehydrates the wound, causing a too quick of a dry, which... will crack again!!! As you can see the fresh flesh healed all right. As all sources said, I had to keep a balance of drying during the day, and moisturizing at night to speed up process, while prevent cracking. The night before the shot was taken, I cut with a flat blade the bit of corn (or hardened skin) still attached, VERY gently removing the by-then useless flap (that's the white area uncolored by the ointment). If I would have to train that night I'd put some moisturizer, a thin band-aid vertically and two rounds of medical tape horizontally around the palm to protect the new healed skin. Specifically for (feet) blisters I recommend the advice of the man who run 50-marathons-in-50-days (in 50 US states!). In the article Dean Karnazes talks about an anti-friction popular with ocean swimmer, triathletes, and in general with wetsuits wearer (he's ALSO a windsurfer... I wonder when? After the 50 marathons in 50 days?!? ). Probably the most over-used part of a gymnast's body is his hands. Rips, blisters and torn callouses are an unfortunate fact of everyday life for us. Over the years we have tried many methods of dealing with them. First and foremost of these is reasonable moderation. 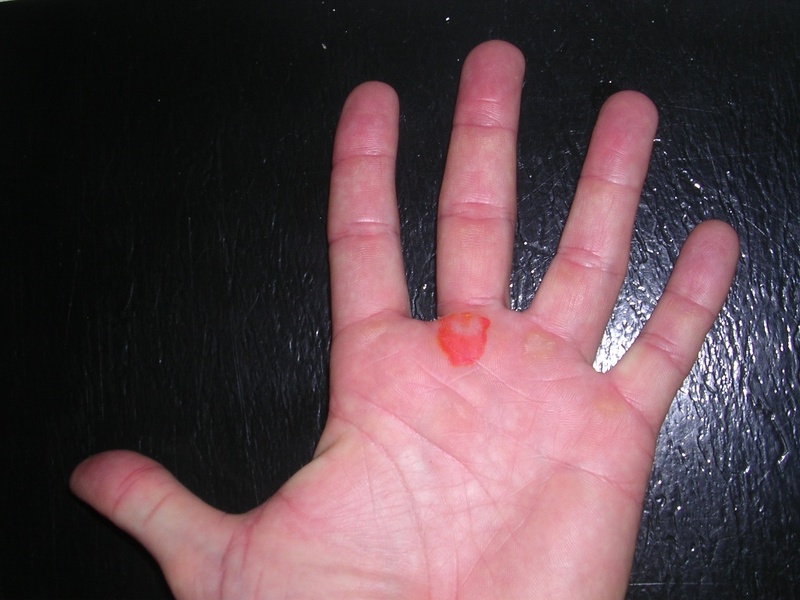 Rome wasn't built in a day and neither will your callouses be. You would like to work up to the edge of a rip, but not over that edge into an actual rip. It takes much longer to heal an injury and completely regrow new callous than to add another layer to an old. Also don't discount the negative impact unnecessary rips will have on your training. The most efficient method that we have found to promote new callous growth is simple but rather painful. It is also an excellent way to promote callous health when you hands are simply "hot". 1) Remove the torn callous; trimming as closely to the edge of the wound as comfortably possible. 2) Smooth the edges of the wound with either a razor blade (proceed slowly!) or a pumice stone. 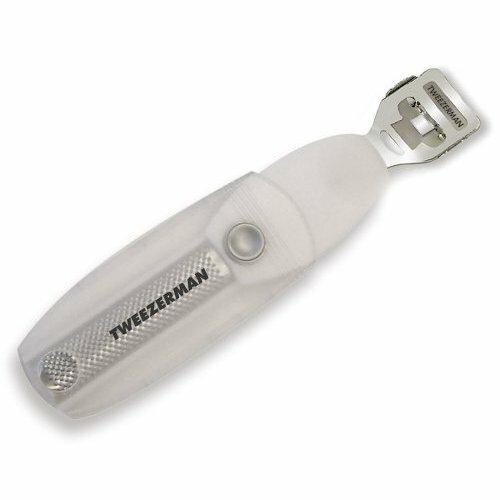 These are available in handled versions as foot callous scrappers at all drug stores. 3) Now soak your torn callous in a bowl of water super-saturated with salt (to supersaturate continue adding salt to a warm container of water until the salt in no longer able to continue dissolving and you have a small amount of undissolved salt in the bottom) several times a day for at least 10 minutes. Initially this may be quite painful. How painful will depend on the depth of the rip. If it is a very deep "bloody" rip, you are in for an interesting experience. It is necessary however as we need to encourage the growth of callous immediately, rather than new soft pink skin that will simply re-tear right away anyway. Unless the blister is unusually deep, in one to two days it should be mostly healed - compared to the 5-7 days needed for conventional treatments. 4) Use just enough medicated chapstick (my personal choice as you can easily carry it in your pocket) to prevent drying to such an extent that the rip cracks. Do not however use Neosporin or something similar; in my experience the use of these types of products will promote the growth of new skin rather than a protective sheath of callous. lol just ripped my first one a while ago.